A few months ago, some friends of mine challenged me to a duel (but there were three of us, so…a trial?) of words. You can find Whisper2Scream’s original post here, LittleLearner’s perspective on his post here and my response to his post here. While waiting for inspiration, I started fooling around with fonts to see if that would help. What a colorless existence this has been; I never knew what was missing until now. Centaur. Harrington. Vijaya. Oh, how I love you. Have you ever stared deep into the eyes of your fonts and let them speak for themselves? We do our fonts a disservice, ignoring their beauty. We go back time and again to that cheating dilettante, that streetwalker of fonts, Times New Roman. 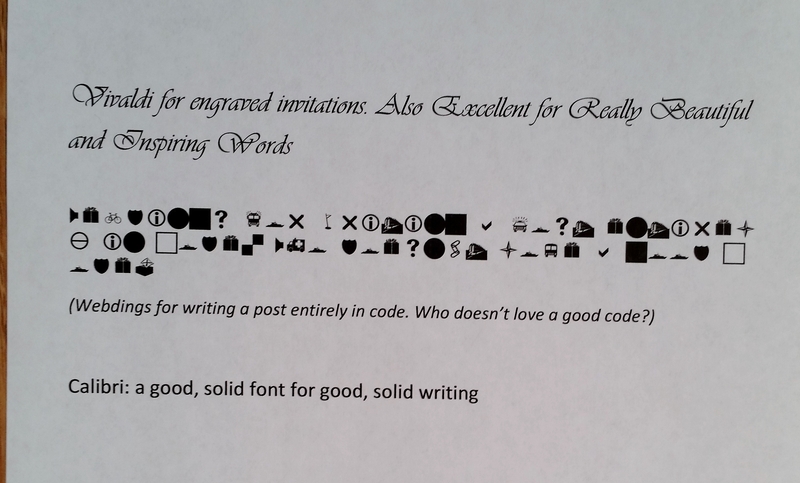 Gaze at your fonts. Listen to your fonts. Find a new love. A font dedicated to you, to your passion. Take time to get to know your fonts. I, for one, plan to invest time in this relationship. Someday, they’ll be writing my obituary. 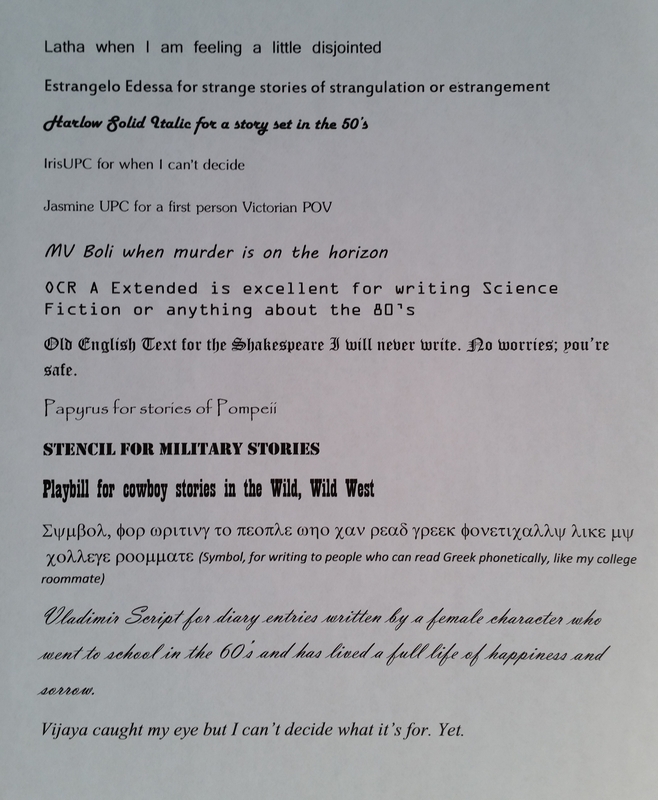 Posted on May 20, 2015, in Fiction and Fun, Writing is fun, Writing101 and tagged blogging101, C. S. Lewis, Centaur, Cinderella, fonts, inspiration, LittleLearner, Love story, Times New Roman, Whisper2Scream, writing, writing101. Bookmark the permalink. 10 Comments. Years ago I overused Comic Sans MS…but I was wondering what that font says to you?? “I’m so 1994.” 🙂 Just kidding. I’d maybe use it to write a book formatted as a 14-year-old’s diary. Sorry, but I totally disagree. I like Times New Roman because it is easy to read and instantly familiar. It brings me comfort and allows me to spend my creative time crafting the flowery words. Also, I don’t like change, new or anything smarter than I am. That is as much true about my computer, tablet, phone and car. 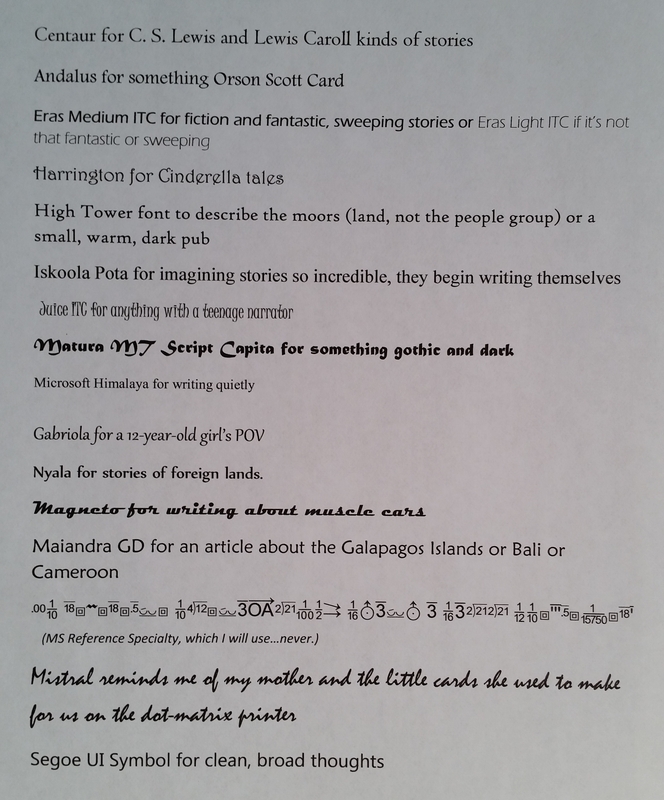 I guess I have to add fonts to that list. Maybe I should just try to get smarter, naw that would make too much sense. You’re allowed to disagree with me any time you like, as long as it’s limited to twice a month. This ia great fun. Such a shame we’re restricted to Times New Roman for so many things – publishers and agents still seem to want you to stick to this. I quite like Calibri or Tahoma for clarity, but tend to send work off in TNR to be on the safe side. They’re quite inspiring, really, aren’t they? This is so much fun, Casey! I have over 2500 fonts on my machine. I LOVE fonts. One of my daughters is getting a degree in journalism with an emphasis in DESIGN. She had to study typefaces and what the font itself is communicating to us. What an adventure!